To avoid being stung by bees, wasps and other insects, check out our page AVOIDING STINGS. 1) It helps if you know what kind of bee is living under the porch. Different creatures require different treatments. 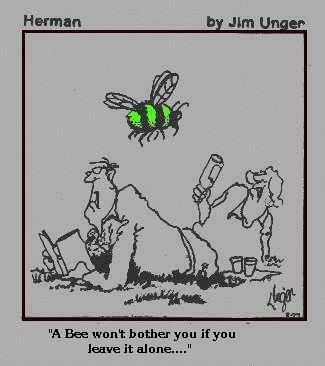 Beekeepers may occasionally be enticed to remove bees, if the bees are actually honey bees. There are some 20,000 species of bees and a whole bunch of wasps and yellow jackets that people occasionally mistake for bees. Only the honey bee species has any value to honey bee-keepers, and if the nest is difficult to access or has been settled for a long period of time, even beekeepers may not want to remove them. 2) For most of these pests, hiring exterminators is the most sensible approach. These folks usually have a a nifty arsenal of powerful toxic chemicals and these folks are supposed to know how to apply the poisons and they even usually dress unfashionably interestingly. However, if you are quite certain you have honey bees, Dr. Tom Sandford, U of Florida, has an excellent web site on How to Remove Unwanted Bees. Tom's web site will help you know what to expect when you begin to remove bees, but if you are not used to working with bees, you should call a beekeeper or a witch-doctor (I am told they are equally easy to find). Often beekeepers are listed with the local exterminators and with emergency units, such as fire and police. ....then you really don't want to kill them! 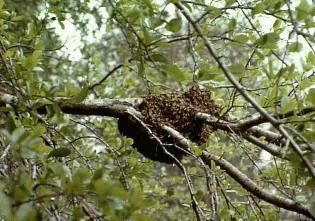 This is a swarm of honey bees and is the easiest and most valuable bunch of bees for a beekeeper to gather. Call a local beekeeper and the beekeeper will usually come in a hurry to collect these bees. If you don't know any beekeepers, contact the local agriculture extension office, the fire department, or the police - these agencies usually have names of beekeepers for this type of emergency. If you are in the US or Canada, nearly every state and province has a chief bee inspector who works for the Department of Agriculture and usually has his/her office in the state/provincial capital city. These people are paid big money to keep lists of beekeeper's names and they are usually but not always nice folks who will try to help you. A. No, sorry, I am up here in Calgary, Alberta, Canada, and though I have seen a screen play adaptation of the great Oklahoma! my travel plans this week do not include a visit to your fair state. May I, instead, suggest that you contact the state capital, where a person who calls him/herself the State Bee Inspector probably maintains an office. This person will not likely come rushing to your door with an empty bee-box, but in most states and provinces the Apiary or Bee Inspector can provide you with advice on bee removal and perhaps the name and address of a beekeeper who lives in your neighbourhood. The beekeeper may be enticed to remove these bees, usually for about $100 US (that equals about $2000 Canadian); if the beekeeper is a friend or relative they may charge you even more for the removal service. A. It is not clear from your note if you are seeking advice on getting rid of your servants or the bees. Since servants are probably more of a nuisance than bees (though I wouldn't know for sure) I will try to offer some basic advice on removing servants fom a castle - you may be able to extend this information to removing the bees, just in case it is the bees you are trying to get rid of. The servants may appreciate a nice, warm, dry cottage instead of your moldy, damp, smelly castle. First, quietly open an entrance to their sleeping quarters and very carefully dig out the servants and their possessions. Then drop them into the clean, dry cottage - taking great care not to kill too many of them in the process! If you find the servants keep slipping back into the castle, consider removing your wife (assuming she is the Queen) and if the servants will have her, make her sleep in the cottage for a while until the servants settle down and accept their new home.